WHY WORK AT LEO CONSTRUCTION? LEO Construction is one of the most well-respected construction companies in the Northern Virginia area. We have a great reputation for our consistent production of quality work in a timely manner. We have a fleet of top of the line equipment to help our employees get the job done right. At LEO we believe in "an honest day's work for an honest day's wage" and provide competitive industry pay. 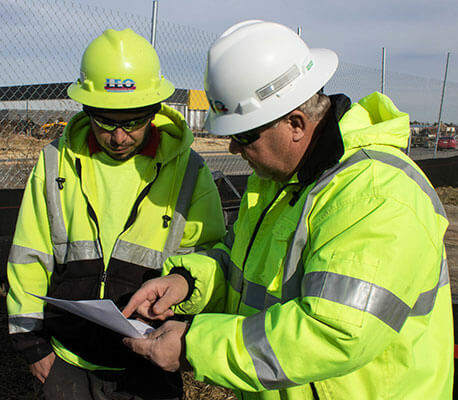 If you want to be a part of the LEO Construction team, browse through our job postings below. LEO Construction Co. is currently looking for laborers for our Gainesville and Leesburg locations. We offer year-round work. Overtime is available! Pay is dependent upon experience. We do drug and alcohol screens on employees and conduct background checks. We comply with all immigration laws and are an equal opportunity employer. If interested, call (703)-443-6608 or complete the form below. LEO Construction Co. is looking for experienced Excavator, Rubber-Tire Backhoe, and Mini-Excavator operators. We offer year-round work. Overtime is available! Pay is dependent upon experience.